Next Sunday, January 22, 2017, new USPS shipping rates will take effect. I ship with First Class mail through the post office, which means that shipping and handling costs for my Etsy shop are also affected. The good news is that Etsy will automatically calculate the cheapest shipping option eligible for the total weight and dimensions of the item(s). 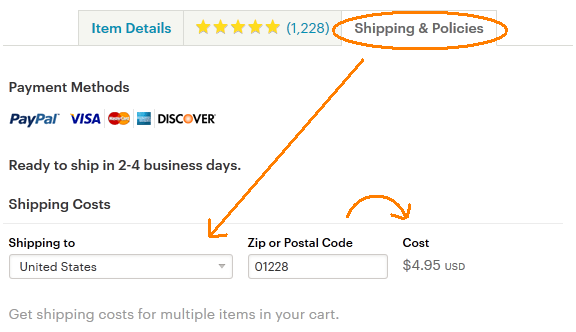 When viewing an item, buyers enter a U.S. ZIP code or their country on the Shipping & Policies tab to generate shipping costs. My shipping fees include the postage itself and a handling fee (= packing materials, paper and ink). As before, I will continue to pass onto buyers the savings I get by buying my shipping labels through Etsy, and I’m glad I can do that – as a customer, I appreciate it when sellers try to keep costs reasonable, and want to return the favor.